WILLEMSTAD – One of the priorities of the government program 2013-2016 is the creation of a development finance organization that will serve as a financial instrument for the sustainable development of the island. The responsibility for the implementation of this program element is under the Ministry of Economic Development. In 2012, a joint commission consisting of representatives of the Government of Curacao and the development bank Korporashon Desaroyo di pa Kòrsou Foundation (Korpodeko) did a study of the relationship between the Government and Korpodeko. 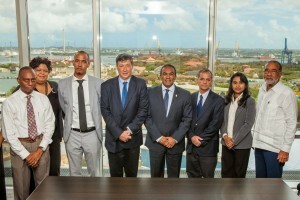 The related report “A Strategic Framework for a Curaçao Development Finance Institute" (CDFI) indicates that Curacao lacks the institutional capacity and structure to meet the current demand of sustainable development, this despite the fact that there are sufficient domestic savings available to invest in development programs and projects. Through the creation of a professionally structured and operating development and financing institute local savings and international cooperation funds can be structurally used for the effective and efficient raising of demand (development programs / projects) and offer (financial resources of local and international investors and international donors). Furthermore, it will be helpful in the overall support of the implementation of sustainable development by applying the five core functions of the development management cycle including offering to support programming and project preparation, mobilization of funds, evaluation of programs and projects, supervision of the implementation of programs and projects, monitoring and periodic evaluation. In order to realize an energetic start of the new development finance organization, the Ministry of Economic Development enlisted the technical support of the "Financing for Development Division of the Economic Commission for Latin America and Caribbean" (ECLAC), through the United Nations Development Programme (UNDP). The first fact-finding mission was from March 24 to 28 in Curaçao for the start of the first phase of the project. Mr. Daniel Titelman, director of the Finance Division for Development and Mr. Esteban Perez, Economic Officer, were part of the mission. The first phase of the project will be financed by the SEI Funds. The process is controlled by the Ministry of Economic Development, Sector Foreign Economic Cooperation, which also provides the secretariat. Mr. George H. Curiel is the project leader. In the past week there has been valuable information exchanged with the Ministry of Finance, the Central Bank of Curaçao and St. Maarten, institutional investors, banks, private sector, development agencies Korpodeko OBNA Foundation, Economic Development Foundation, Reda Sosial as well as with government agencies which will be involved in the process. On Friday, March 28th, the Minister of Economic Development received from the ECLAC experts an initial report of their findings and recommendations with regard to objective, structure, capitalization, important conditions relating to governance and professionalism, as well as the next steps of the process. The report of the ECLAC mission is expected in the second half of April. This report will serve to further evolve the next steps with regard to the preparation of the establishment of the CDFI and as input to continue dialogue with the stakeholders in the process.